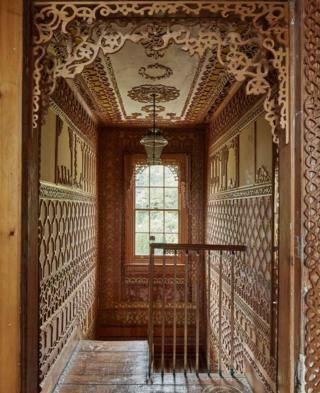 The interiors are covered in intricate wooden carvings bearing Islamic, African and English influences, and produced entirely by hand by the building’s former owner – the writer and civil servant, Khadambi Asalache. Born in Kenya, the son of a chief, Asalache studied architecture in Nairobi, and art in Rome, Geneva and Vienna. 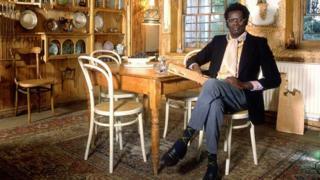 He produced poetry and novels, and – after a spell with BBC Africa – took a job at the Treasury in London. In 1981, he moved into a dilapidated house at 575 Wandsworth Road. 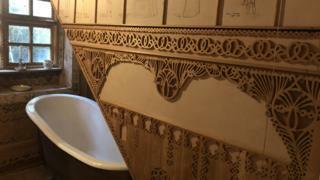 Confronted with a damp patch that resisted treatment, he opted to cover it instead, producing the first of his wooden carvings. Twenty years later, he was still at work. 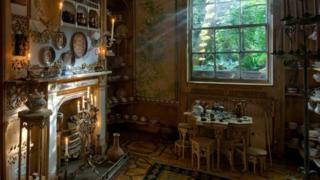 The house has just become London’s newest museum, managed by the conservation charity, the National Trust. 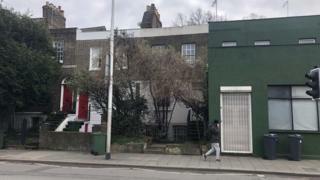 “I think the house really stands for the power of human endeavour, and for what can be created with time and dedication and love,” the Trust’s Laura Hussey told the BBC’s Newsday programme. 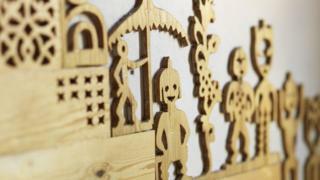 The raw material for the carvings was typically salvaged from rubbish dumps. 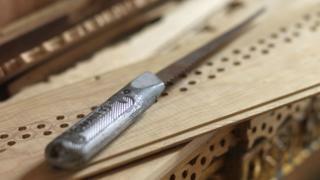 Asalache used a fretsaw to give new life to discarded doors and boxes. … and memories of trips closer to home, to the theatre. There is even a collection of English pottery. … the extraordinary world of Khadambi Asalache lives on, awaiting interpretation. 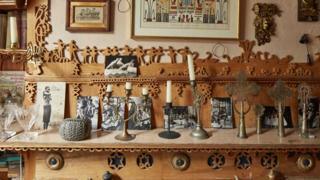 Pictures supplied by the National Trust and by Janet Ball.